I hate tidying up, and I am no real fan of cleaning. This has proved to be a minor source of drama in my life, because I like things tidy and clean. I feel like if you don’t mind cleaning, you sort of do it as you go along, and if you’re me, and you want to live in a shining and organized home but really hate getting there, then you sort of do it in bursts, breaking out the vacuum and the dust rags, or tipping out a closet when you can’t stand it a minute longer. Something happens, it crosses my personal threshold and I have to clean it. In my experience, this tip over the edge is usually accompanied by some feelings of resentment and anger towards the other people who live with you who don’t seem to have a personal threshold for dirt or mess and would simply wallow in their own filth forever, like a barnyard animal who doesn’t even have a closet to put things into. (How many feelings of rage you have while cleaning is, and should be, related to how many young, strong, beautiful human beings who are depending on your for support are lying on the couch asking you how much longer you’re running the vacuum for because they can’t really hear the stereo. By the time they were grown my girls used to leap to their feet when they saw a dustrag in my hand.) Now that only one of my kids really still messes up the house, I’ve learned a few things, like that a lot more of the mess belongs to Joe than he would have had me believe, and while I knew he was paying the children to clean so he wouldn’t have to, didn’t quite believe he had managed to cover for him completely – which he apparently did. The upshot is that I like things tidy, and while I hear legends whispered of people who find fulfillment and happiness in cleaning, not a single one of them lives here, and so I have to have strategies to keep the house in something close to a state I can live with, without cleaning all the time. The answer to this has been to try and have very little stuff. The more stuff we have, the more cluttered things are, the harder it is to manage our stuff. Dusting is easy if there’s nothing on the table. Washing the floor is easier if you don’t have stuff thrown all over it – and for this family, the only way to keep things off the table and the floor is to not own a lot. People can’t throw eight weeks of laundry on their bedroom floor if they don’t have eight weeks of clothes. This has worked really, really well for us over the years. Every time I feel like the house is out of control, I know what’s wrong – we have too much stuff, and some has to go. I watch three or four episodes of Hoarders to get myself in the mood, and off I go. Now, I know what you’re thinking. You’re thinking "Big talk from the lady with yarn everywhere. What’re you doing about that, Queen-tidy-pants?" and to you I say that the stash is mostly under control. I have rules, and I check in with them every so often so that the stash doesn’t turn into something that gets me on TV. Rule #1 is that if I don’t love it, it can’t stay. 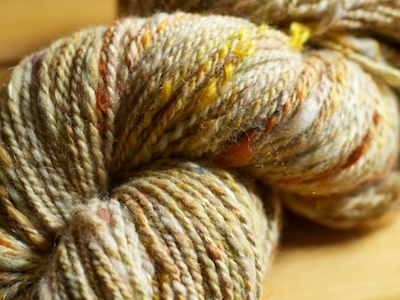 That rule means that if a skein of yarn accidentally shows up in my house because someone gave me a bag of stuff that used to be their mums, or I realize that something I bought three years ago really isn’t anything I love anymore – or even if I try a yarn and don’t like it – it and all its mates hit the donate pile. I don’t keep yarn I don’t love. 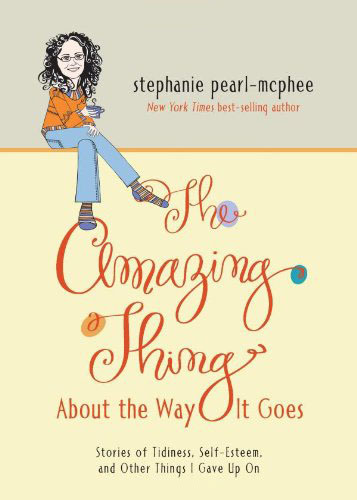 I don’t try and figure out how to make it useful, I don’t keep it because some day it might come in handy… I give it away to someone who will find it useful and does love it so that it might brightly flower into its glorious destiny – rather than rot away in the back of my closet. Rule #2 is absolute. If it can’t fit, it can’t stay. Over the years I have created several stash containments zones. I have the stash room upstairs, I have the built in closet in my office, and a few other spots like baskets and bins. This is where stash must go. Stash cannot go other places, or soon you’re like that lady in Hoarders who was just going to put a few extra canned goods under her son’s bed and now the kid’s sleeping in the bathtub clutching a mangy towel and crying at night. (I like to think of that show as what’s keeping me scared straight. One episode and I’m upstairs getting rid of all the old toothbrushes screaming "THIS IS WHERE IT STARTS.") My point is that I’ve got ample space for stash. Lots. The textile arts are important to me, I earn part of my living at it, and it’s only reasonable that I have a space dedicated to managing the accoutrements of my craft. If I was a carpenter, you would expect me to have a big workshop all full of the stuff that I used. You wouldn’t expect me to have boards and saws all over the house, and that’s the rule here. Stash stays in the stash zone, and if stash is leaking out of the stash zone, then something must be done. People. Stash is leaking out of the stash zone. In specific, the spinning stash has gotten out of containment area 1, and after having made incursions into the temporary holding zones, it has now seeped further into common living space. 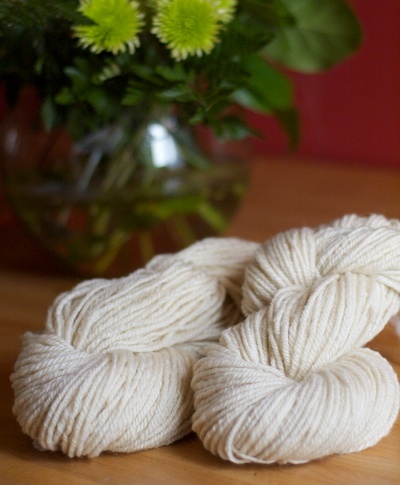 I told myself that the 4 batts I made with Judith were too beautiful to put away, and that’s why I was keeping them on the bookshelf outside the bathroom, but that’s not what happened. There was no room for them in the spinning bins, and the spinning bins already had bags stacked on them, which is a violation of containment rules. (Holding areas outside of containment zones can only be temporary, like when you buy something that will fit, but you didn’t put it away yet. Like that.) Then Tina bought me four big batts at Madrona – I wasn’t going to buy anything because I knew I was in trouble, but Tina saw them (I wasn’t looking, that’s what saved me) and the next thing I knew she’d bought them as a present, which was so sweet, but really- it was about 400g (almost a pound) more fibre coming into the house. 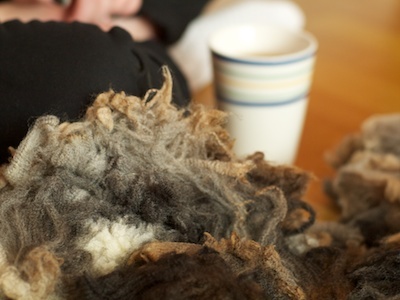 Then, just to prove that there’s something wrong with me, as I was standing there looking at those batts thinking "I love them, but where will I put them" when Judith offered me fleece and I was like "HIT ME." 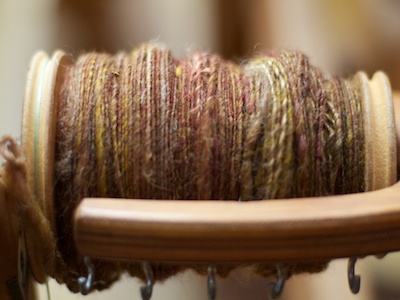 So now here I am, with a spinning stash problem of a fairly decent size, and I only have a few options. 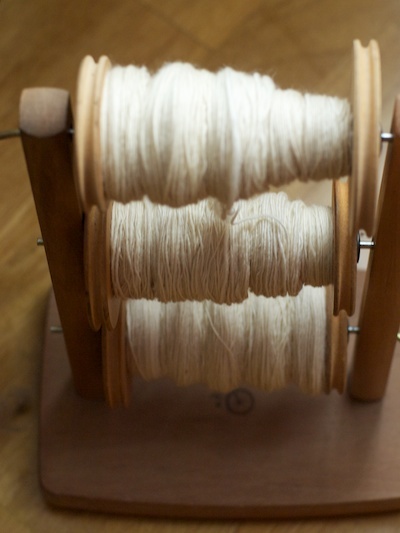 I can go through the spinning stash and get rid of some things, which frankly isn’t going to happen because I love it all, or I can use some of it up, turn it into yarn and give it away so that the stash fits again. You can bet which one I’m running with. I’m going to go on a sprint and move all the fibre I can through this house until it fits. 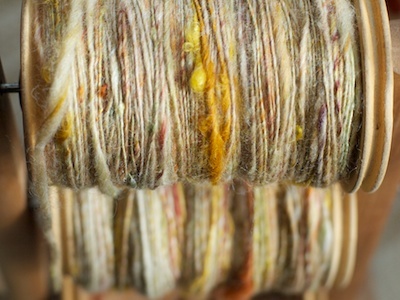 That BFL the other day was a nice start, but the four batts I made and the four Tina bought me and the fleece from Judith still don’t fit, so off I go. 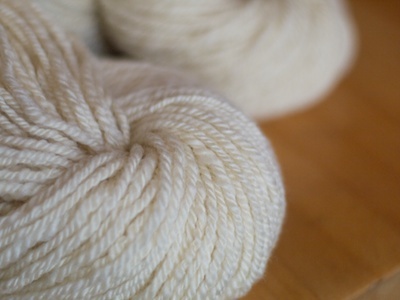 The first thing down the chute: The batts Tina bought me at Madrona. I don’t know where she got them (I’m not sure she knows where she got them. 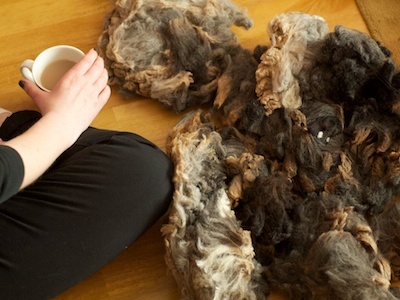 Blasted wool fumes, maybe someone will recognize them.) 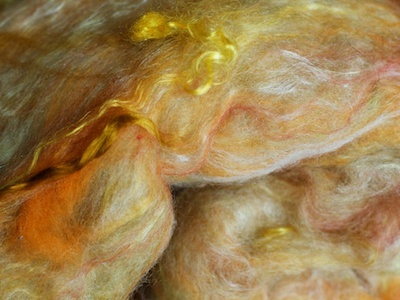 The first one was a beautiful yellowish wool batt, with locks of mohair thrown in for interest, and what looks to me like little shots of silk here and there. 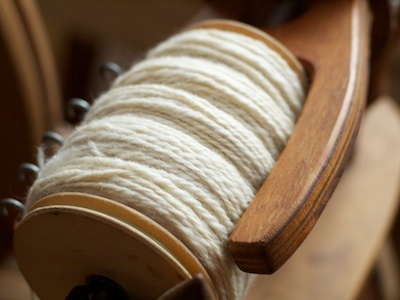 and I love the 2-ply I ended up with. It’s got Denny’s name on it I think. I love the colours – but the texture’s sort of whacky, and I feel like it is calling Denny’s name into the air. ins might be Denny’s too. 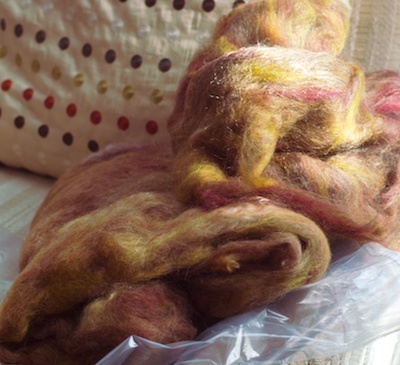 These batts were mostly brown/burgundy/red, and had the same little chunks of mohair locks throughout. Very fetching. I’ll ply later, those singles need to rest. Next up, at least two of the batts outside the bathroom door. Then a few more goodies from deeper layers of the stash. Then maybe a few spinning things I’ve been hiding in the yarn stash can go where they’re supposed to, which might actually mean that all the yarn would fit, which might free up shelf space for the books that are spilling into the kitchen, and then the whole stash will be under my total control. I bet that’s exactly what’s going to happen. I’ll spin four things and the house will be clean. Also, my tiny yarn elves will clear up the mess that the magazines are in, and their trusty wee unicorn steeds will clear up the bags of yarn we’re pretending aren’t in the office, right before the fairies make a rainbow bridge to the button box, and clear all the buttons out of my office, complete all my paperwork, and leave only happiness and sparkles in their wake. I’m speaking in Shreveport this Saturday. (Shreveport, I was very excited to learn, is in Louisiana, which I very much enjoyed the last time I was there.) I told twitter I was talking on Friday, which was a total lie. The correct info is here. The Sock Camp tee-shirt contest ends today. You can go here to vote if you would like to, and please only vote once per knitter. At the end of today we’ll turn off comments, address the job of counting the votes and on the 14th we’ll announce the winner. It’s turned out (like everything Sock Camp related) to be way better than I dreamed it. You’ll love the designs. I’ve been asked a bunch of questions about Sock Camp (apparently there’s some confusion about what it might be, which is weird, I mean Sock Camp is such a NORMAL idea that you’d think it would take no explanation.) So I’m working on a quick Q&A. I hope it answers your questions, and those of your extended family who heard about it and now think knitters are weirder than ever, which we’re totally not. We’ve been this weird all along. 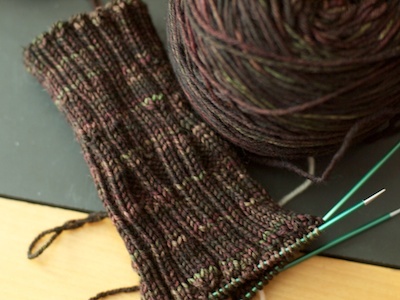 Also, I totally finished the thrummed mittens, and now I just have to pressure Sam into modeling them for me. I’m sure that won’t be at all tricky. I gotta go spin now. Wouldn’t want to let the elves down by not doing my part. 1. 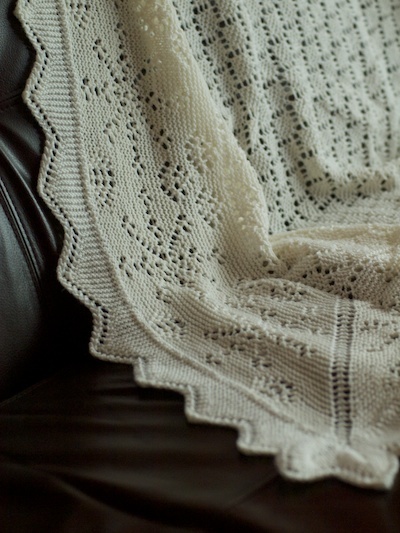 I am seriously excited about knitting things that are not a baby blanket. 2. Not that knitting the baby blanket wasn’t fun, it was super fun. It just wore on a little towards the end. I blame the edging. The first few peaks were fun, but there’s 80 on that blanket. Towards the end it took a certain fortitude of spirit that I usually reserve for cleaning out closets. 3. Just about the minute I finished that blanket, I looked around for something to knit that was totally and completely different and not at all like a baby blanket. Thrummed mittens. 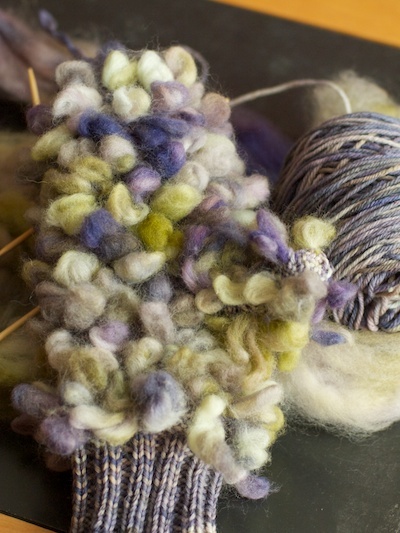 Mine are a kit from Liberty Fibers, bought at the Squam Art Fair last year. I’m a little helpless in the face of thrummed things. 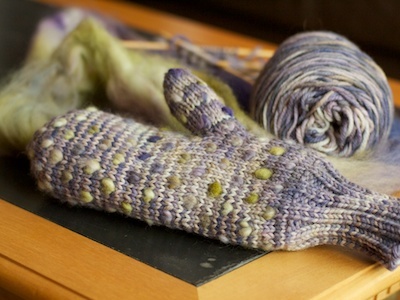 Natalie was here this morning and we were looking at the mitten and she was asking me why I was knitting thrummed mittens in March (when winter is almost over) who they were for…. and I had no answers for her. None. I have no intentions for these at all. 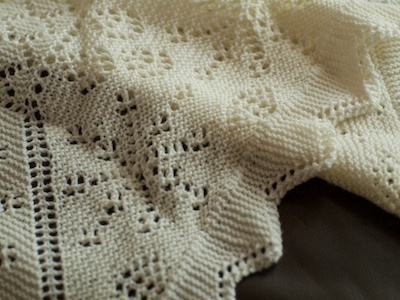 I’m just knitting these because they’re fun, fast – and because they’re not a white baby blanket. I also knit them because even though I’ve been knitting thrummed stuff forever, turning them inside out to reveal their Muppetesque innards always cracks me up. 5. I’m also knitting socks, but you probably guessed that. Ken’s birthday was a few days ago, and he always gets Birthday Socks. This year I was a little bogged down with the Great White, and so he didn’t get them. As compensation, he got to pick any yarn from the stash, and any pattern he could find. 6. The yarn part was pretty easy for him. He picked Dream in Color Everlasting in Congo. I love that sock yarn. I think it’s fabulous. Strong, bouncy – super cushy. 7. Ken choose Francie as his pattern, which I’ve knit for him before, but I made them out of Alpaca Sox, and as beautiful as they were, they got felted. (I got them back. My feet are smaller than his.) He said he misses them. 8. Yesterday was Tuesday, and I spun. 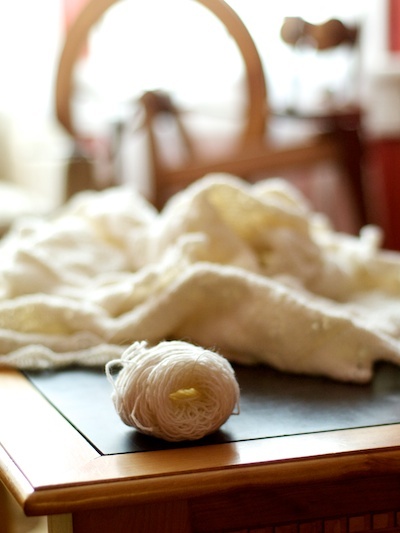 I’m still trying to finish the cream BFL (there’s a lot of it) and I admit that I’m feeling a loss of momentum on it. Maybe having finished a big white thing I can’t face another big white thing, but this morning found me with a big chunk of CVM that I got from Judith MacKenzie at Madrona – all spread out on the living room floor like a buffet. 9. I’m trying to get it into my head that if I just finish the BFL, then I can have the CVM. 10. 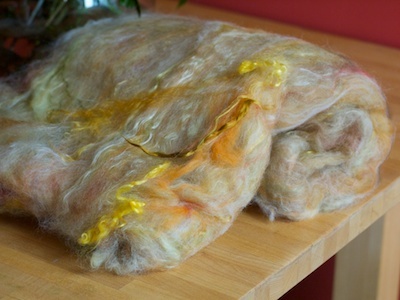 I’m also trying to convince myself that washing up that fleece so that I’m ready when I finish the BFL doesn’t count. I think I’m buying it. 11. BFL is Blue Faced Leicester. CVM is California Variegated Mutant. They are kinds of sheep. 12. I love the mutant part. I know you’re too little to know it, but you’re sort of a big deal around here. Not only are you one of the worlds most wanted and celebrated babies, you’re also going to go down in history as the only baby I’ve ever loved who got born before their blanket was finished. 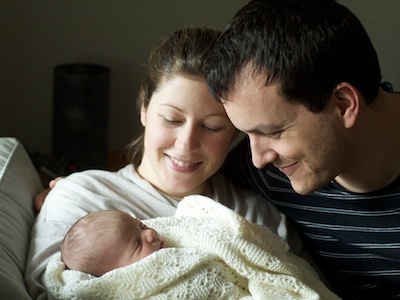 Yesterday when I finally brought it to your mum and dad and they put it around you, I felt a profound sense of relief. Your mum looked so pretty, and like she was finally feeling better, and she said that she hoped that the circus the two of you have been through for the last few weeks was over, and I said that I thought it was. I told her that I thought she’d run out of trouble. That there was just nothing else left for her to navigate, and that I really believed now everything would be smooth sailing. My small friend, the truth is that in my heart, I had started to believe that nothing could go right for the two of you until I’d handed over that talisman, and that on some level, the blanket was more essential than I had thought. 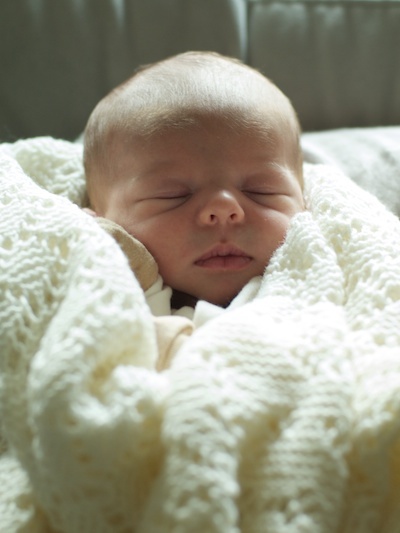 Those are probably the crazy thoughts of a superstitious auntie, but I just got it into my head that maybe the hours of love in these blankets are somehow protective. A shield of sorts. A symbol of how loved and wanted and unique you are in our world, and how grateful we are to your parents for bringing you here, and how everyone in this family is here for you, and intends to stand between you and trouble for every day of the rest of your life… as much as we are able. I started thinking, as I was rushing to finish, that maybe this whack of trouble was the result of that blanket not being in place. That maybe once I had you wrapped in that thing, it would be a sign to the universe that you have an army of love around you, and that anything that wants to mess with you has to go through us first. I hope that’s how it works, because that’s what that blanket means. Like you, your blanket is one of a kind. The blanket is big, and I thought it was bigger than I wanted it to be, but now that I think about you and how you’ve arrived and the impact you’ve had – I don’t think that it could be one centimeter smaller to do you justice. 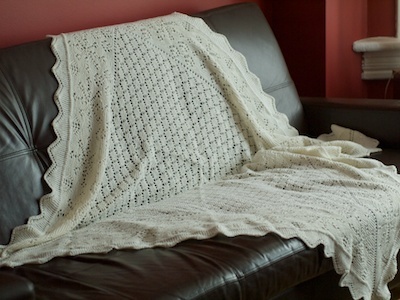 Like you, this blanket looks delicate, but is strong. 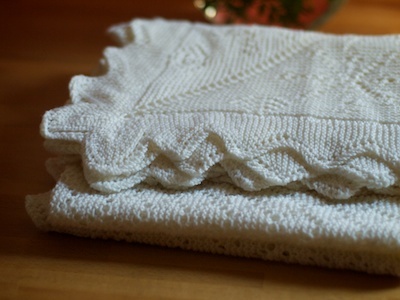 I was thinking that maybe a ginormous swath of white lace wasn’t really a baby boy thing, but I realized that it makes total sense, since somehow this blanket is as much for your mum as it is for you. Your father loves you to distraction, and is entirely devoted to you – any fool can see that, but I think your dad would be the first person to stand up and say that what your mum has been through and done for your little family in that last few weeks was brave, and she’s bloody fierce, and your arrival has only made her more strong and beautiful. It almost seems silly that all I’m giving the three of you is a blanket. Welcome. Be safe. Be warm. This blanket might be the death of me. Yesterday I was so full of hope, I even imagined (briefly) knitting other things. Maybe a sweater, finish some socks. I bought the latest knitting magazines and the world of possibility stretched before me. I might knit something red I thought. Or blue. Or Green – anything except for the eternal white that’s stretched out for so long. I felt sure that it was all going to work out. I’d have enough yarn, I’d apply myself, maybe stay up all night and just get it done. I’m not done. I knit the snot out of it and it’s still not done, and I think I can say with confidence now that there’s not going to be enough yarn. I weighed the ball and it was 19g. Then I worked one repeat, and weighed again. 16g – so that tells me that each repeat takes about 3 grams. 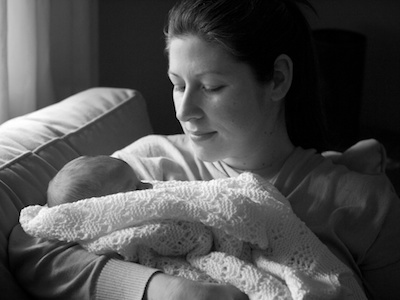 Then I counted the repeats left – which was a rather heartbreaking 16. If each repeat takes three grams, then I need 48 grams, not 16 – and that means it’s back to the store for me. 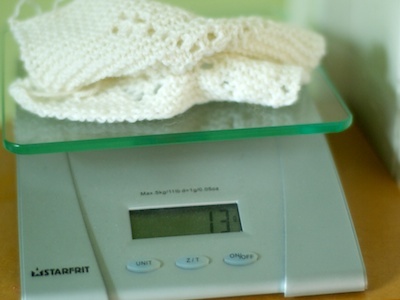 Just to be sure, I actually weighed my swatches, thinking maybe I could ravel them and get the extra yardage there. No dice. Even if I use the swatches, I still need 19 grams, and as I realized I was going to be going to the store for so little, I was suddenly demoralized. I can’t go to the store today because I have to drive aways, and while I’m driving I won’t be knitting or yarn shopping, and so that means that even though tonight is prime knitting time and I could finish this bad boy? I won’t be able to. I was sitting here trying to fetch the yarn with the power of my mind when the phone rang. It was the lovely and charming Rachel H, on her way to the yarn shop close to her work, and she asked me if I wanted her to score a ball, and maybe drop it in my mailbox so it would be there when I got home? I almost fell over. It was a miracle. It was actually like I was sitting there just wishing the yarn would appear today, and there’s Rachel H solving the whole problem. I gratefully accepted, and made a mental note get her a little present, or kiss her full on the mouth or something. Relieved, I started packing up to leave, thinking about how happy I am, and about how great it is that that little problem evaporated totally, and about how tomorrow I’ll knit something that isn’t white while the blanket blocks. Rachel H is totally the kind of person who texts you pictures of yarn from the store, so a minute later when my phone went off, I expected a picture of the yarn and a very Rachel-esque text message like "VICTORY IS MINE" or "SHE SHOOTS, SHE SCORES!!" Instead? This, clearly is a crushing defeat. That store was my whole backup plan. That’s where I was going to go in the morning, and now they don’t have it and I’m going to have to start calling around, and I’m absolutely sure I’ll find some, for the love of wool, I’m sure one of you has 19 grams of it, but whatever I do now, it’s going to take me a bit to get it, and that brings me to my next great idea. We should be able to fax yarn. At least small quantities. No reason humanity can’t work that out.